My last flight assignment consisted of four days in Hawaii. It was one of those trips which make me (almost) feel guilty for associating it with the word “work”. Of course, there are plenty of journeys which are the polar opposite: long overnight flights, challenging weather, and minimum rest. But when you’re relaxing on a warm tropical island, those thoughts are easily banished to the back of one’s mind. For the moment, at least, the life of a charter pilot is a charmed one indeed! This external pod really caught my eye when we passed it on the ramp. It contains the Earth Observing Laboratory’s W-band cloud radar. As we taxied onto the ramp at Kona International Airport (PHKO) after a beautiful flight out from the mainland, one particular aircraft caught my eye. 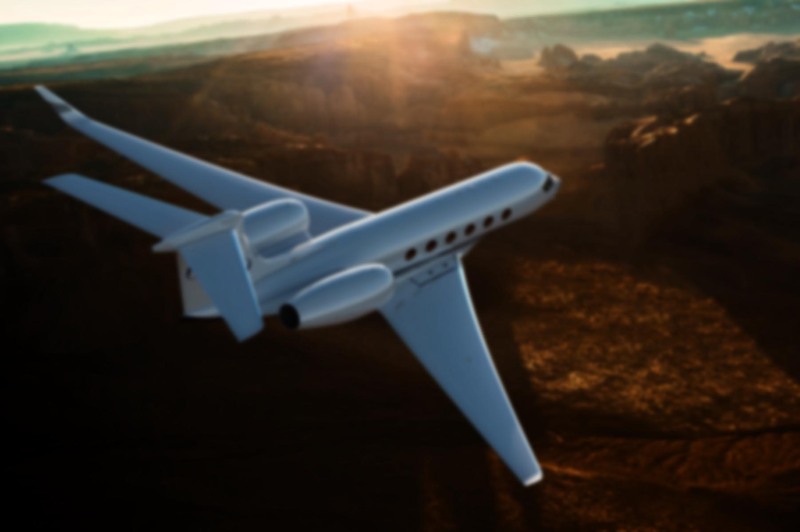 It wasn’t the brand new G650 perched majestically at the front of a line of business jets but rather the aircraft next to it, a colorfully painted Gulfstream V equipped with pointy, silver-tipped under-wing-mounted pods. If it wasn’t for the words “National Center for Atmospheric Research” painted above the cabin windows, one might have wondered if this wasn’t some sort of weapons system. I suddenly remembered that Hurricane Guillermo was slowly churning toward Hawaii from the southeast. The storm was still nearly a thousand miles from the archipelago and hadn’t impacted our flight that day in the slightest. As they say, “out of sight, out of mind.” I assume the G-V was there to conduct research on the storm systems (there were several large ones) brewing in the Pacific Ocean. And if the crew was able to spend a bit of time laying out by the pool… well, that’s just a cross they’d have to bear. That uniquely outfitted airplane got me thinking about “special mission” aircraft and how business jets serve millions of people who never get to ride in them and are probably not even aware of their existence. Even among the general aviation community, I’d imagine plenty of folks would be surprised how many of these highly modified airplanes are out there and what they do for us on a daily basis. 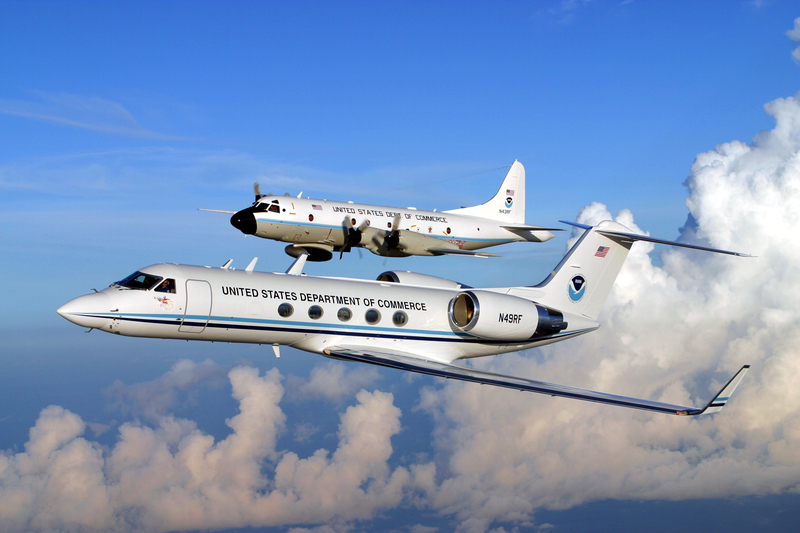 NOAA operates several special mission aircraft, including this highly modified Gulfstream IV-SP, which flies hurricane and winter storm missions. I first became aware of Special Mission aircraft when I was in initial Gulfstream IV training. There were five pilots in my class. Most of us were employed by typical charter or Part 91 operators, but the youngest member of our cadre worked for NOAA, the National Oceanic and Atmospheric Administration. He had been flying the agency’s DeHavilland DHC-6 Twin Otter for a couple of years and was offered a slot flying either the Lockheed P-3 Orion or the Gulfstream IV-SP. He really loved the idea of flying the big turboprop, but the only training available for the Orion was through the military. As I recall, it was a two year long process, whereas training on the G-IV was available through civilian providers and wouldn’t take nearly as much time. 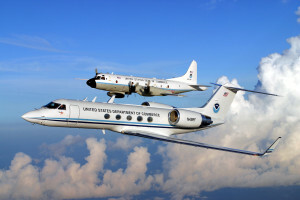 NOAA’s Gulfstream is one of those Special Mission airplanes which benefit everyone. The jet has twice the altitude capability of a P-3 Orion, which allows it to drop instruments known as Omega dropwindsondes into the storm from higher up. The data collected has improved landfall prediction accuracy by more than 20 percent, saving lives and property in the bargain. This Lockheed-modified G-III is used for ISR missions. I’m most familiar with the Gulfstream special mission aircraft because that’s the type I fly. 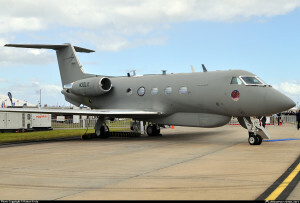 At my home base, I’ve come across a Lockheed-Martin DRAGON, a highly modified Gulfstream III which serves as an ISR (intelligence, surveillance and reconnaissance) platform for military, homeland defense, disaster relief and humanitarian assistance needs. The Israeli air force’s airborne early warning aircraft is a modified G550. It’s so radically altered, in fact, that it’s almost unrecognizable as a Savannah product. 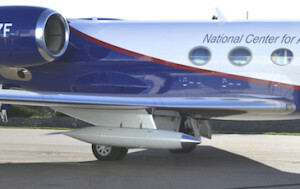 The U.S. government operates a large fleet of Gulfstreams to provide airlift for senior U.S. government officials, members of Congress and military leaders. The current fleet includes the G-IV (military designation C-20) and G-V/550 (C-37) models, which are operated by every branch of the military as well as the U.S. Coast Guard. The Shuttle Training Aircraft flight deck: half space shuttle, half Gulfstream. One of the most famous Special Mission business jets served our nation’s space program for more than three decades. NASA operated four Gulfstream II jets which were heavily modified to simulate the space shuttle’s descent profile. 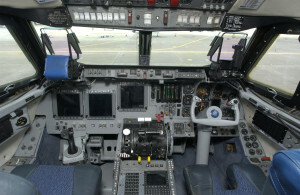 Officially known as the Shuttle Training Aircraft, the right half of the cockpit was standard bizjet; the left side replicated the orbiter’s flight deck. Shuttle approaches were so steep — 20 degrees! — that the jets had to be operated with the main landing gear down and both Spey engines running in reverse at 92% N2. Below is a YouTube clip of the STA in action. Aside from a downline or spin in an aerobatic aircraft, I’ve rarely seen an altimeter unwind that quickly. You’ll find Gulfstreams, Citations, Lears, Hawkers, and many other business jets used for signals intelligence, moving cargo, towing targets, medevac, oceanic patrol, search and rescue, and just about anything else you can think of. As many of my readers are aware, one of my early professional flying jobs involved Special Mission aircraft: I flew modified U-21As around Southern California for a company called Dynamic Aviation. We’d hand-fly at low altitude while dropping sterilized Mediterranean fruit flies. If you’re interested in reading about that operation, I wrote an extensive 2009 post entitled “A Day at Medfly”. I should note that Dynamic Aviation is probably the world’s largest operator of Special Mission aircraft. They’ve modified hundreds of King Airs, Dash 8s, DC-3s, Beech 18s, etc for corporate and government customers. I believe they’re even using a Gulfstream now. They’ve outfitted airplanes to search for minerals, control oil spills, eradicate mosquitoes, perform ISR tasks, map the earth, and more. It’s a fascinating niche, and one that has them operating on virtually every continent. Anyway, back to that airplane we saw on the ramp in Kona. A bit of internet research reveals that it’s called HIAPER (High-performance Instrumented Airborne Platform for Environmental Research) and is owned by the National Science Foundation. It took more than $81 million and nearly twenty years from conception to delivery. After Gulfstream finished building the airplane, it spent two years undergoing heavy modification and testing at Lockheed before entering service. That’s pretty typical, because adding sensors and pods often requires cutting holes in the pressure vessel, and that means the basic structure has to be re-engineered to ensure adequate safety. You’re taking an aircraft that was designed to do one thing and rebuilding it to accomplish a completely different mission. 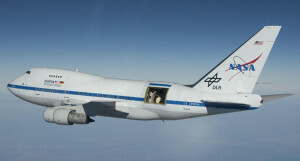 I recently flew with a guy who was the lead test pilot for the SOFIA airborne observatory. It’s essentially a Boeing 747 retrofitted with a massive telescope in the tail. There’s a lot more to it than just clearing out the passenger seats and sticking some equipment into the fuselage. The cabin has to remain pressurized, but the telescope must be exposed to the open air. A new rear bulkhead had to be fabricated and installed for the pressure vessel, along with an 18-by-13 foot door for the telescope itself which was strong enough to open and close while flying at 41,000 feet and 500 knots. I don’t know much about the telescope, but the work that went into retrofitting the airframe is awfully impressive. In a world of bespoke aircraft, the Special Mission variants take customization to a whole new level. Next time you see a business jet on the ramp with odd or exotic modifications, take a moment to appreciate the time, effort, money, and engineering that went into what is surely a one-of-a-kind machine. This is an excellent article…thank you! Great post Ron. I really like SPECOPS planes, and like you, I appreciate the reengineering of the airframe. Thanks Mauricio — glad you enjoyed the article. I’ve come to realize that these airplanes have many fans and seem to attract a crowd wherever they go. Ever since I posted the entry, I’ve been seeing special mission aircraft all over the place. Just this morning I’ve seen photos online of a 747 and DC-10 converted to fire fighting duty, for example. Well I haven’t had any opportunity to see a converted SPECOPS planes, specially because they are not common in this part of the world. Actually, I’ve only seen a firefighter Canadair in Italy this July, but that’s a plane made for that.